"It's like music to my ears." The late Gladys Milton (1924-1999) was recruited by the Walton County Health Department (in DeFuniak Springs, FL) to help resolve a need for a practitioner to provide delivery services to poorer women in and around the Walton county area. Too, because of racial segregation during that time, African-American women in the area mainly had to rely upon the services of midwives. After her recruitment, the Walton County Health Department then arranged for Gladys to be trained by two of the local physicians in the nearby town of Florala, Alabama. Following her training, Gladys was licensed to practice midwifery in 1959. From 1959-1976 Gladys Milton delivered babies and provided postpartum services in the homes of her clients. She also sought additional aid for these women from social programs or donations from church and civic groups. Then, in 1976, Gladys established Walton county's first birthing center, a facility now known as Milton Memorial Birthing Center (MMBC). The goal of the historic MMBC was to provide a safe, family-oriented environment for low-risk women who could not afford the cost of hospital care. However, many women chose MMBC because the style of services was based on the midwifery model of care. Gladys Milton, regarded by many as a folk hero and pioneer, is acclaimed for her work as a midwife on local and national levels. A Folk Life Production of Walton County, Florida featured a theatrical play that highlighted Gladys' fight with Florida during the late 1980s to maintain her midwifery status. Her work as a midwife has also been the subject of numerous newspaper articles, television broadcasts and documentary films. The book, "Enduring Women", contains a chapter about Gladys' life/career and she is noted in other books written on the subject of midwives and midwifery practice. Two autobiographies, "Why Not Me?" and "Beyond The Storm", have also been published. In addition to being a midwife, Gladys Milton was a community activist. She was a strong advocate of the preservation of history and the promotion of literacy. For years she worked toward establishing a library and museum in the northern part of Walton county. On the day before she passed away, Gladys petitioned the Walton County (Florida) Board of Commissioners to make the library a reality. Although she did not live to see it, a library is now open in north Walton county. Located in Flowersview, Florida, the library is named the Gladys N. Milton Memorial Library in her honor. 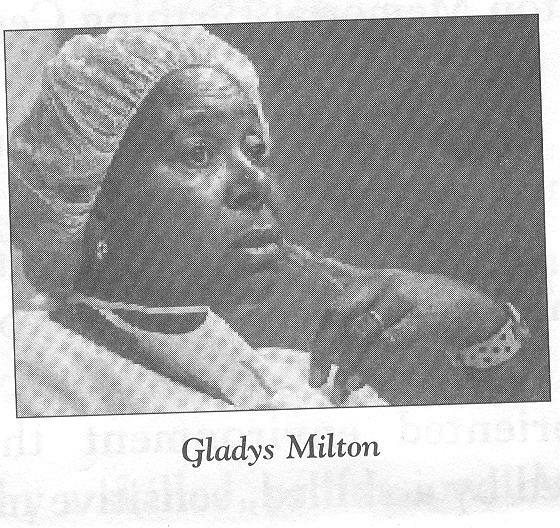 Gladys Milton delivered approximately 3,000 babies during her notable midwifery career (from 1959-1999). Her work as a midwife led to her induction into the Florida Women's Hall of Fame in 1994 and, posthumously, into Okaloosa County (Florida) Women's Hall of Fame in 2001. The legacy of her work still continues at Milton Memorial Birthing Center through her daughter/fellow midwife, Maria Milton.